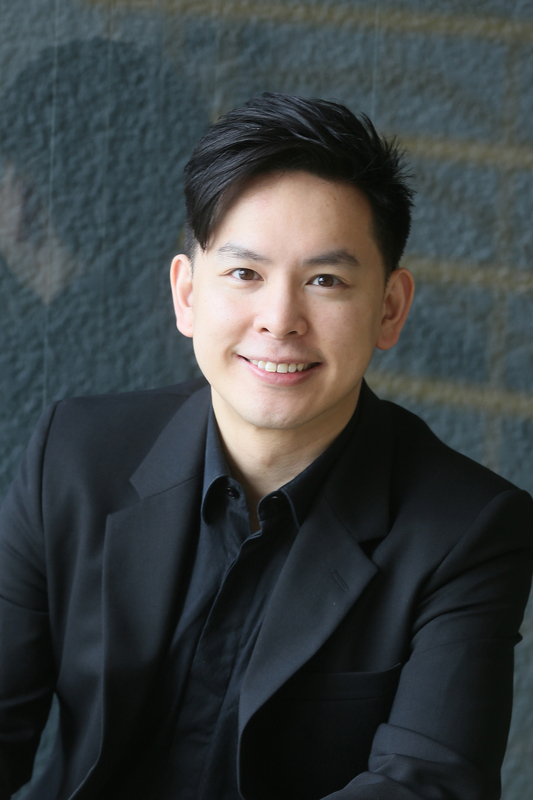 Bass-baritone and conductor Apollo Wong has sung operatic and musical roles including the Superintendent Budd and Bottom in Britten’s Albert Herring and A Midsummer Night’s Dream, Ariodate in Handel’s Serse, Frère Laurent in Gounod’s Roméo et Juliette, Zuniga in Bizet’s Carmen, Barone Trombonok in Rossini’s Il Viaggio a Reims, Colline and Simone in Puccini’s La Bohème and Gianni Schicchi, Don Alfonso and Sarastro in Mozart’s Così fan tutte and Die Zauberflöte, Geppetto in Valtinoni’s Pinocchio, and Javert in Les Misérables, among others. He also sang in the world premiere productions of Chan Hing Yan’s Heart of Coral (Lu Xun), Datong (Kang You Wei) and Ghost Love (Moonlight), and Jeffrey Ching’s Before Brabant (King Oryant/Markes). Amongst his concert and oratorio repertoire, he has notably both sung the bass solo and conducted Mahler’s Symphony No. 8 “Symphony of a Thousand”. Other bass solo repertoire include Bach’s St. John Passion and St. Matthew Passion, Beethoven’s Symphony No. 9, Brahms’ Ein Deutsches Requiem, Faurè’s Requiem, Mozart’s Requiem, Puccini’s Messa di Gloria, among others. He has sung under conductors such as Yves Abel, Paolo Olmi, Renato Palumbo, Joseph Rescigno, Helmuth Rilling and Francois- Xavier Roth. Educated in Los Angeles and Berlin, Wong has won first places in Palm Springs Opera Guild Vocal competition and the Pasadena Opera Guild Vocal Scholarship. Being an active conductor, Wong is currently Music Director of The Learners Chorus and The Learners Orchestra, and Chorus Master of the Hong Kong Philharmonic Chorus. He has also conducted the Hong Kong Philharmonic Orchestra and worked as Music Director of the Hong Kong Youth Choir and the Opera Hong Kong Children’s Chorus. Being recognized as an inspiring chorus and orchestral builder, from community to professional ensembles, he has brought a great variety of both choral and symphonic music to the public, such as Magnificat by Bach and Rutter, Brahms’ Ein Deutsches Requiem and Schicksalslied, Gounod’s St. Cecilia Mass, Lauridsen’s Les Chansons des Roses and Lux Aeterna, Lully’s Te Deum, Mahler’s Symphony No. 2 “Resurrection”, Martin’s Mass for Double Choir, Mendelssohn’s Lobgesang, Mozart’s Great Mass in C Minor and Requiem, Pärt’s Credo, Poulenc’s Gloria, Prauliņš Missa Rigensis, Prokofiev’s Alexander Nevsky, Rachmaninoff’s The Bells, Rossini’s Messa di Gloria and Stabat Mater, Stravinsky’s Symphony of Psalms, Tallis’ Spem in Alium, and Verdi’s Messa da Requiem and Quattro pezzi sacri. He has been chorus masters for conductors such as Lorin Maazel, Helmuth Rilling, Tan Dun and Edo de Waart; assistant conductor in Puccini’s La Bohème, Gianni Schicchi, Turandot and Verdi’s Aida, conductor of Opera Hong Kong Summer Opera Camp productions of The Magic Flute and The Pirates of Penzance and principal musical advisor of Hong Kong Children’s Choir musical Magical Beanland.